In a dream world, money grows from a branching tree somewhere in my expansive and flourishing vegetable garden. It comes out in hundred dollar bills and blooms year round. From that tree, I'd make dinner for people all the time. There would be a long wooden table with bench seats and I would get to watch people savor fresh foods and enjoy each other’s company. Lots of candles, mason jars, big white roses and lilies. I’d host brunch after church on Sundays, and kids would chase the chickens that laid the eggs we were eating. People would be real. We would talk about how we’re really doing and eat slow. Something I certainly need to practice before this fantasy plays out. Bringing it back. This week I started cooking for a family and have a dinner party tomorrow. Intimidating, yes, but I think the flavors I have going on below are crowd pleasers. As mentioned, I like feeding people and Hugh likes being the test bunny (what? ), so these side jobs are a pleasure. If you find yourself in a position of feeding a group of people, and I hope you do, this recipe is affordable, and can be easily doubled or tripled. The colors contrast beautifully with a crispy green salad. My mom has always been good with plants, I'll be working on that tree. I used Pacific Cod as the fish, which is easier to find at a fish market than a grocery store. Remember that polenta expands like rice, so use a big pot for ample stirring. Turn on the grill and oven to 475’. 1. Peel back the husk and silk of the corn, discard. Give it a little drizzle ½ tbsp. olive oil and a bit of garlic salt and put on the high heat of the grill. Continue to rotate, cook for ten minutes. Remove to cool. 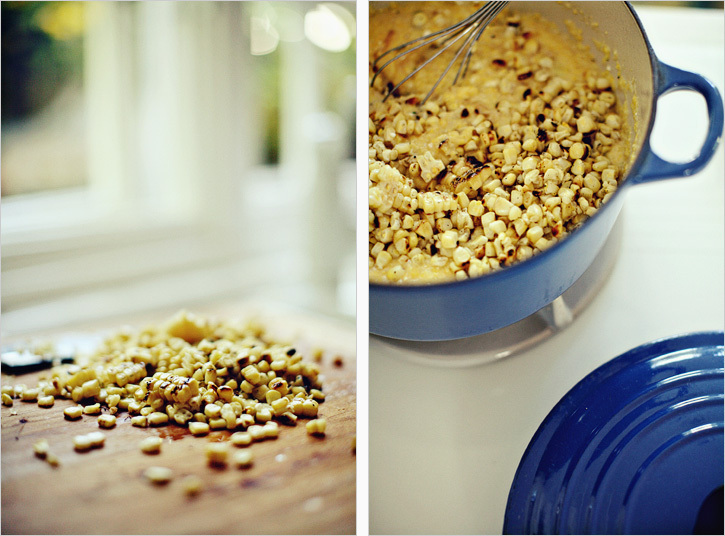 Cut the kernels off. 2. Heat the other ½ tbsp. olive oil. Add the sliced onion and sauté on medium until light brown in color, about 15 minutes. Turn off heat. 3. Prepare the fish topping. In a small bowl, mix the feta cheese, yogurt, garlic salt, lots of pepper, lil lemon juice and 2 tbsp of the chopped parsley. Mix. 4. Coat with cooking spray either a small baking dish or baking pan, put the fish skin side down. 5. Sprinkle fish with pepper and a pinch of salt. 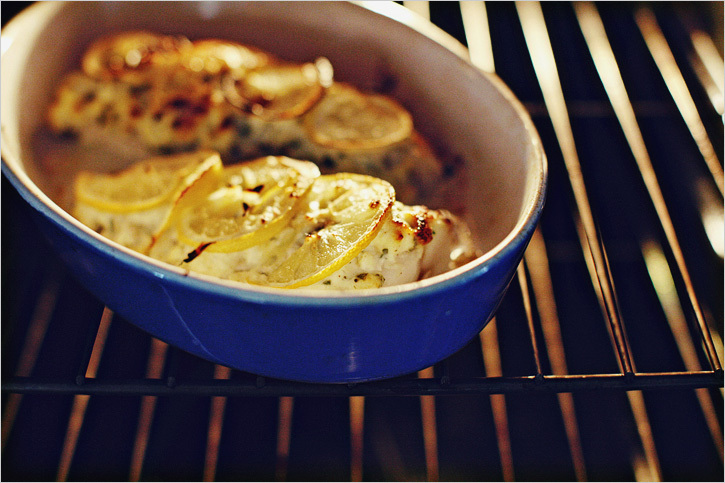 Divide the feta topping on top of both fish pieces and lay a few slices of lemon on top, slightly overlapping. Drizzle with a tiny bit of olive oil. Put in on the top rack of the oven and keep an eye on it while you proceed with the polenta. Fish should take about 12-15 minutes depending on thickness. 6. Continue with the polenta while fish is baking (if you read recipes prior, start heating the stock while prepping the fish). Bring the stock to a simmer. Slowly add in the milk. Pour in the polenta and continue to whisk until it begins to thicken, this should take about 15-20 minutes, you want it a bit thinner than mashed potatoes. Take off the heat. 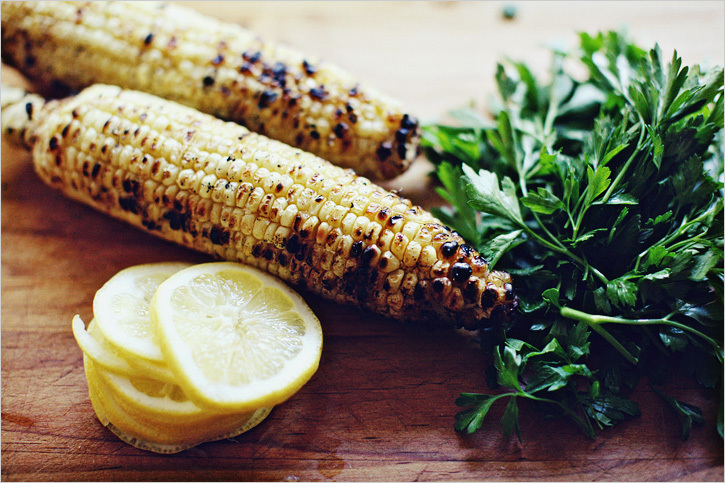 Gently fold in the caramelized onions, grilled corn kernels, juice of half a lemon, handful of chives and salt and pepper to taste. Lastly, fold in the 1/2 cup of feta cheese. 7. To serve, put a good portion of polenta on the plate, top it with the lemon fish and sprinkle with a generous amount of parsley.